The highest day temperature in January 2019 was 43°F. The lowest night temperature was 16°F. The average values for day and night temperatures during January were 34.4°F и 29.7°F respectivly. The average sea surface temperature in January 2019 for Holodnaya Rechka was 52.2°F. The maximum and minimum values were 50.0°F and 55.6°F respectively. You can expect various weather conditions during January. Be ready for sunny, cloudy or even gloomy days. Precipitation total in January for Holodnaya Rechka is 5.8 in. It makes january one of the most rainy months of the year. The average wind speed in January is 6.0 mph. This value is relatively stable throughout the year. We are using day length and cloud cover information for each day of the month to calculate averages for this chart. 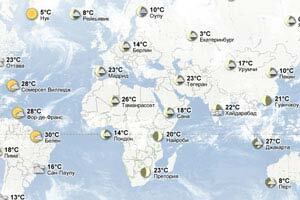 Average sunny hours for Holodnaya Rechka in January is 4.7 hours.